GDL agent Jack Hannah with the Openbah, St George Simmental cross steers. 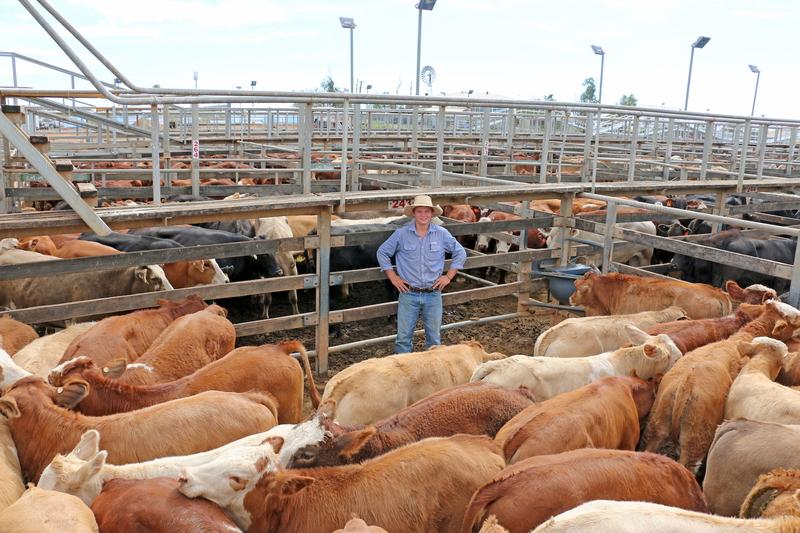 The steers sold to 324c/kg, reaching a top of $842 to average $787. Cattle numbers increased dramatically off the back of strong prices last week. Cattle were drawn from a widespread supply area including the NT and NSW, and a large panel of buyers was present and operating. Young cattle dominated the yarding with large runs of cattle present and the overall quality was good. Prices decreased across most categories. Light weight yearling steers under 280kg sold 9c to 20c/kg cheaper. A sample of light weight yearling heifers under 280kg increased by 11c/kg. Medium weight 2 score cows declined by 23c to 31c/kg. There were only small numbers of 3 score cows yarded and the medium weight 3 score cows decreased by 6c, while the heavy weight 3 score cows sold 6c/kg dearer. Calves made to 315c to average 229c/kg. A large sample of lightweight yearling steers under 280kg to restockers sold to 324.2c to average 29c/kg. edium weight yearling steers under 400 kg to feed made to 295c to average 289c/kg. Light weight yearling heifers under 280kg to feed or background made to 274.2c to average 251c/kg. Medium weight yearling heifers under 400kg to feed sold to 270.2c to average 254c/kg. Weaner steers under 220kg topped at 320c/kg and averaged 269c/kg, weaner steers in the 220-280kg range reached 324c/kg and averaged 282c/kg. Steers in the 280- 350kg range reached 296c/kg and averaged 278c/kg, and steers in the 350-400kg range reached 291c/kg and averaged 280c/kg. Feeder steers in the 400-550kg range topping at 292c/kg and averaging 281c/kg. Cows and calves hit $700/unit. AJ & SJ Smith, Openbah, St George sold Simmental cross steers to 324c/kg, reaching a top of $842 to average $787. Defiance Cattle Co, Roma sold Angus steers to 320c/kg, reaching a top of $784 to average $672. The Angus heifers sold to 260c/kg, reaching a top of $632 to average $507. Moonya Pastoral Co, Roma sold Angus cross steers to 309c/kg, reaching a top of $709 to average $608. The Angus cross heifers sold to 242c/kg, reaching a top of $515 to average $432. Sheppard Pastoral, Amby Downs, Amby sold Angus cross steers to 302c/kg, reaching a top of $788 to average $749. G & G Burey, Springhill, Amby sold Charolais cross steers to 300c/kg, reaching a top of $1,100 to average $659. The Charolais cross heifers sold to 220c/kg, reaching a top of $534 to average $452. Doce Pty Ltd, Springwater, Injune sold Droughtmaster steers to 296c/kg, reaching a top of $967 to average $902. M & K Hudson, Tongy, Mitchell sold Cross breed steers to 296c/kg, reaching a top of $718 to average $718. TL & ML Kelly, Tocal, Mitchell sold Angus cross steers to 294c/kg, reaching a top of $1,018 to average $863. The Charolais cross heifers sold to 235c/kg, reaching a top of $731 to average $607. R Loughnan, Alicker, Roma sold Charolais cross steers to 294c/kg, reaching a top of $944 to average $913. RE & ED Smith, Marranoonbah, Condobolin sold Angus cross steers to 294c/kg, reaching a top of $771 to average $699. Formosa Farming Co, Formosa Downs, Surat sold Charolais cross steers to 292c/kg, reaching a top of $1,357 to average $1,252. JR & KP Schelberg, Dumfries, Muckadilla sold Angus cross steers to 291c/kg, reaching a top of $1,261 to average $1,183. J & A Ford, Lewah, Roma sold Angus cross steers to 290c/kg, reaching a top of $1,124 to average $883. EJ & CF Rolfe, Marie Downs, Roma sold Charolais cross steers to 290c/kg, reaching a top of $1,001 to average $1,001. Parklane Grazing, Parklane, Drillham sold Brahman cross steers to 289c/kg, reaching a top of $814 to average $737. Brian Cloherty, Kingull West, Roma sold Santa cross steers to 288c/kg, reaching a top of $901 to average $901. The Santa cross heifers sold to 248c/kg, reaching a top of $744 to average $744. TR & RJ Wichlacz, Woodbine, Muckadilla sold Santa steers to 285c/kg, reaching a top of $1,182 to average $773. Heifers under 220kg topped at 260c/kg and averaged 192c/kg, while heifers in the 220 – 280kg range topped at 276c/kg and averaged 223c/kg. Heifers in the 280- 350kg range topped at 276c/kg, averaging 235c/kg. Heifers in the 350-450kg range topped at 275c/kg, averaging 251c/kg. Taylor Grazing, Kevington, Injune sold Angus cross heifers to 276c/kg, reaching a top of $873 to average $746. Killarney Park Grazing Pty Ltd, Killarney Park, Tambo sold Santa heifers to 260c/kg, reaching a top of $1,062 to average $983. Warby JJ & BA, Wagganba, Glenmorgan sold Droughtmaster cross heifers to 260c/kg, reaching a top of $858 to average $618. M & MT Bright, Karoola Park, Roma sold Angus cross heifers to 254c/kg, reaching a top of $1,011 to average $864. The Doug Cameron Livestock Trust, Nive Downs, Charleville sold Charolais cross heifers to 250c/kg, reaching a top of $504 to average $363. Mirradong Meats Pty Ltd, Middle Creek, Moonie sold Santa cross heifers to 246c/kg, reaching a top of $649 to average $602. SM & CJ Robertson sold Angus cross heifers to 242c/kg, reaching a top of $1,052 to average $633. PE & JE Crocker, Crochdantigh, Muckadilla sold Simbrah heifers to 240c/kg, reaching a top of $797 to average $765.